“We are excited to announce this integration because this gives our BGCitizen commuters more convenience in their daily commute,” said Mr. Jun Galvez, GM of Bonifacio Transport Corporation. The BGC Bus line connects BGC to EDSA and Ayala Center. It has a Euro-5 compliant fleet and operates 24/7 to serve thousands of commuters, mostly employees who work in BGC and Makati. BGC Bus also takes pride in its information systems, whereby waiting time for the next bus can be accessed using the BGC app, and are also shown in most bus stops within BGC. 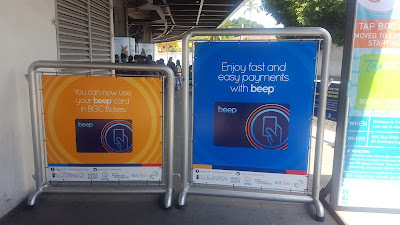 The beep™ card replaced the old Tap BGC stored value card. It can be purchased and reloaded at the BGC Bus Ayala and Market Market terminals as well as all LRT and MRT stations. It is reloadable and is valid for four years. More information about beep™ is available at and on Facebook (beep card) and Twitter (@beep_card).